Irritable Bowel Syndrome, or IBS, is a disorder that affects the large intestine, causing uncomfortable symptoms such as diarrhea, abdominal pain, and gas. These symptoms are triggered by certain foods, such as milk, sugar, and even caffeine. Those suffering from this disorder may have a hard time gaining weight, especially if their symptoms are extremely painful or they experience diarrhea often, which prevents their body from absorbing the nutrients that it needs. If you can relate to the problems above, don’t worry. It’s completely possible for you to gain weight and to do it in a way that will keep you and your body happy. The guide provided below will help you to do exactly that. In order to reach your target weight, you will have to consume more calories throughout the day. IBS has a tendency to cause mild to severe stomach cramps and this may cause some people to skip meals when they should be eating instead. Although it may be hard to do, try to eat even when your symptoms begin acting up. Skipping meals can cause your body to lose even more nutrients and calories than IBS causes you to lose alone. Adding another meal to your day or even continuously snacking throughout the day on foods that are lighter on the stomach but contain a large amount of calories will not only help you gain weight but will also keep your IBS in check. However, don’t overeat or stuff yourself in an attempt to get more calories. This will only result in your symptoms acting up and will probably lead to you skipping more meals in order to avoid the discomfort that comes along with eating too much. For a clearer idea of what foods you should be consuming to accomplish this seemingly impossible task, take a look at the next tip. You might be asking yourself right now, what are low-FODMAP foods? Low-FODMAP foods are foods that contain low amounts of Fermentable Oligo-Di-Monosaccharides and Polyols, which are sugars that tend to trigger symptoms in people with IBS. Foods that are high-FODMAPS include onions, apples, and sausages, to name a few. These are the types of foods that should be avoided at all costs when you begin planning out your diet. 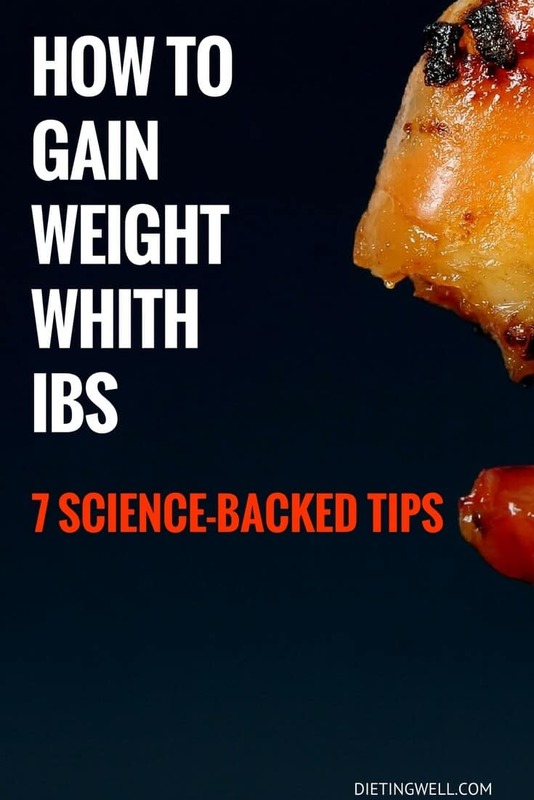 (Read more on foods to avoid with ibs). If you stick to consuming these low-FODMAP foods and limiting the amount of foods that trigger your symptoms, you should have an easier time gaining weight and avoiding your IBS symptoms. That being said, some people have a higher tolerance to different types of foods than others do. Make sure that you experiment to see which types of foods you can consume large amounts of and which ones will upset your stomach. Some of these foods might not trouble your stomach as much either if your IBS symptoms are mild rather than severe. Take this into account when you’re trying out foods that are known to cause IBS symptoms to act up. Once you have a clearer idea of which foods you can eat and which foods you will have to limit, you can better determine the types of foods that will better assist you in your weight-gaining journey. Another way you can pack on the pounds when IBS seems to be working against you is by replacing zero-calorie drinks with calorie-rich drinks. Coffee and tea, for example, can be packed with more calories by adding milk such as soymilk or a full-cream milk that is lactose-free. These types of milk work well for making smoothies and shakes as well. Switching your water with a higher-calorie drink will also give you an opportunity to get more nutrients, especially if you’re making a smoothie, which you can make with low-FODMAP fruits or even vegetables. If you decide to add drink mixes to your beverages such as instant lemonade or protein powders, research the drink mix prior to using to make sure that it won’t bring about IBS symptoms. Some mixes contain too much sugar and possibly lactose. Exercise is a great way for those with IBS to gain the weight they need. Not only will it help you add pounds without having to eat terrible foods, but the endorphins released by exercise will make you happier when your IBS symptoms are at their worst. If you decide to exercise, avoid any type of exercise that focuses too much on cardio and burning calories. These exercises will only cause you to lose more weight, which is the opposite of what this guide is trying to help you accomplish. Focus instead on muscle-building exercises that will help you gain more weight without adding too much unhealthy fat to your body. As an extra boost, you can drink protein shakes and other exercise drinks to help you bulk up while weight training. If you have issues that are preventing you from weight-training, you could engage in relaxation exercises such as abdominal breathing exercises or progressive muscle relaxation instead, which help to soothe the symptoms of IBS. Cardio and calorie-burning activities can be added to your exercise routine once you’ve reached your target weight. If you drop too many pounds again, cut the cardio out of your regimen and stick to exercises that build muscle and soothe your IBS. Healthy oils, such as coconut oil and extra virgin olive oil, contain a large amount of calories and nutrients that your IBS is depriving your body of. Adding these oils to your diet will help to reduce inflammation and enhance hormone function. You can use extra virgin olive oil when cooking or you could add it as a dressing on your salad. Coconut oil can be added to pretty much anything you can imagine and can be even eaten on its own. Besides the amount of calories that you will be consuming, these oils have a variety of other health benefits, such as preventing heart disease and boosting your immune system. The only disadvantage to using these oils seems to be their saturated fat content. These saturated fats raise the level of cholesterol in your body. If this presents a problem for you, consider an alternative for these oils in your diet. You can get all the key nutrients your body needs and a surplus of calories by making a green smoothie for yourself in the morning. A green smoothie consists of low-FODMAP fruits, vegetables, and even seeds and oils. If you would like to try adding a green smoothie to your day, you can find plenty of IBS-friendly green smoothie recipes scattered throughout the internet. One thing to consider when making a green smoothie is serving size. If you have too large of a smoothie, you could potentially trigger your IBS symptoms. This is especially true if you’re mixing too many sugary fruits and vegetables together. Also, make sure to avoid drinking the smoothie too fast. Consuming it slowly will help to prevent you from feeling too full or triggering an IBS attack. The best thing that you can do for yourself is to create a plan that will help you achieve your weight goals. If you don’t map out your meals, you can end up triggering your symptoms by consuming too much or by consuming the wrong types of foods. Take the time to sit down and plan your day out. What will you have for each meal? What will you eat as a snack between meals? The more solid of a plan you have, the better the chances are that you will achieve your weight goals. You will also be able to use this plan to see what foods may or may not work for you. If one food may fill you up too quickly and doesn’t contain enough calories, you can replace it with a higher-calorie food that will fill you up less. You don’t have to make a meal plan exactly like this, this is only an example. However, this should give you an idea of what type of foods you should be eating throughout the day and how to customize it to fit your needs. The symptoms of IBS can be difficult to live with, but they shouldn’t keep you underweight or malnourished. By eating the right foods, planning your meals, and consuming more calories, you can gain the weight you want and keep your IBS in check. These things will take time but once you find the diet that works for you and you stick to it, your IBS and weight concerns will be a thing of the past.